This past Saturday, Keith VandeStadt hosted an operating session on his proto-freelanced Suffolk Northern Railway. The railroad is an Appalachian coal hauler set in 1952 that runs from Hampton Roads to Cincinnati and Toledo. The modeled portion runs from Blue Ridge, VA (east staging) to Gallipolis, OH (west staging). Follow along as we catch some of the action. In the photo below, Bob Bartizek is working Yaeger Yard in Segway, WV. This is a division point between the mountains to the west and the foothills to the east and all road freights change power here. Keith recently painted all of the freight diesels in the attractive blue and orange scheme and converted the layout to DCC. All of the locomotives are sound equipped and everything runs beautifully. In the next photo, Anthony Hardy has just brought YC-8 down into the siding at Mineshaft Gap, WV. The train ran light from Segway up to Hadley, WV (where the Shay is standing on the siding) to pick up loads that had been brought down from a mine further up the mountain. With YC-8 in the hole, a drag freight out of Segway tackles the 3.0% grade heading west. All westbound freight trains out of Segway require helpers. In the photo below, Anthony watches the action as one of the roads Mallets shoves hard on the rear end of the train. In the next photo, John Miller is getting clearance from the dispatcher in order to take his train west from Blue Ridge. The tracks on the lower level to John's right head into east staging and the tracks on the upper level head into west staging. In the background is St. Amour, WV which is the major industrial area on the layout. Later in the session, we catch the mail train as it stops in St. Armour to set out an RPO car and pick up two westbound cars. The switcher based at St. Armour will handle the swap. All trains on the Suffolk Northern have some switching to do at some point along the line. Next up, we catch Smokey Doll as he gets ready to take a coal drag west out of Segway. Toward the end of the session, Darren Williamson is taking a work extra through Bryan Ferry, VA heading toward Segway. Darren is the one who installed all of the decoders in the Suffolk Northern motive power and finally convinced Keith to convert to DCC. And in the last shot, we catch the superintendent himself observing the action toward the end of the session. The Suffolk Northern really is a beautiful layout that has all the pieces, from a well thought-out concept to top notch equipment to incredibly enjoyable operations. It's a real treat to get to run on this railroad. Thanks, Keith, for a great session and for sharing your railroad with us. This past Saturday, FRC (Free Range Chicken) made it onto the Virginian Railway. 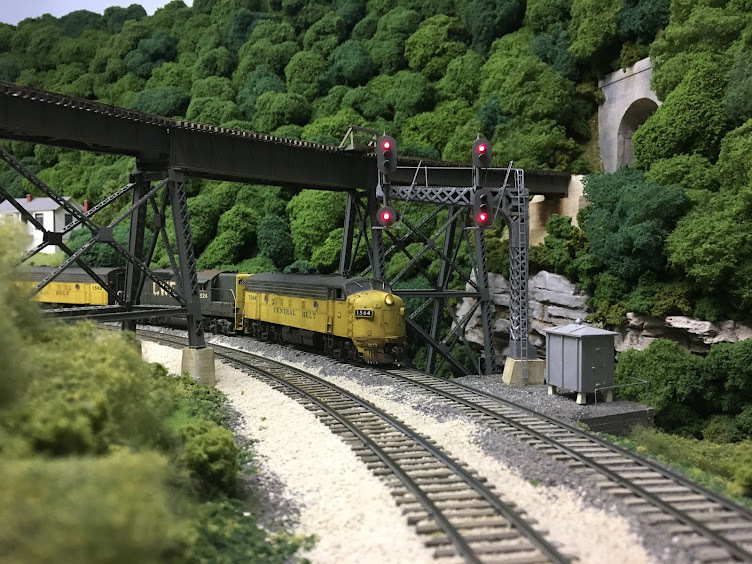 In the photo below, he's heading west across the Sweeneyburg Bridge on the Deepwater District layout of Gerry Albers (http://www.deepwaterdistrict.com/). 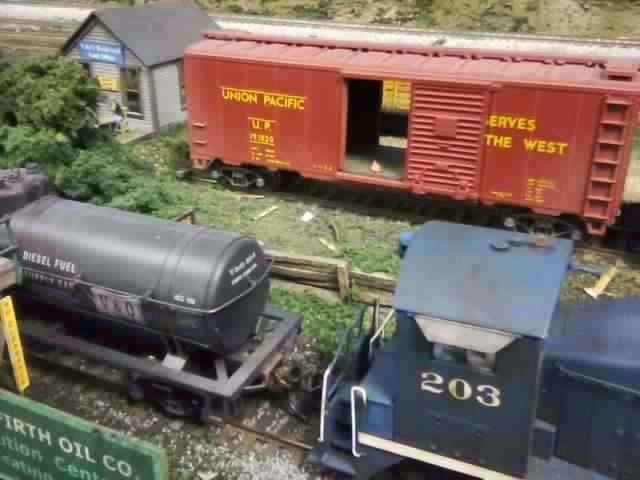 Later in the day, the UP boxcar got switched out at Alloy onto V&O rails. In the picture below, FRC is taking in the scenery while waiting for the car to end up at its ultimate destination.